This is what happened to me few times with my Samsung Galaxy S5 mini. And I think it happens to other Samsung phones too. When I tried to connect to my PC or laptop it was showing empty folder only. Like the picture below. Well, it is very simple. First unlock your phone then connect to the PC or laptop. 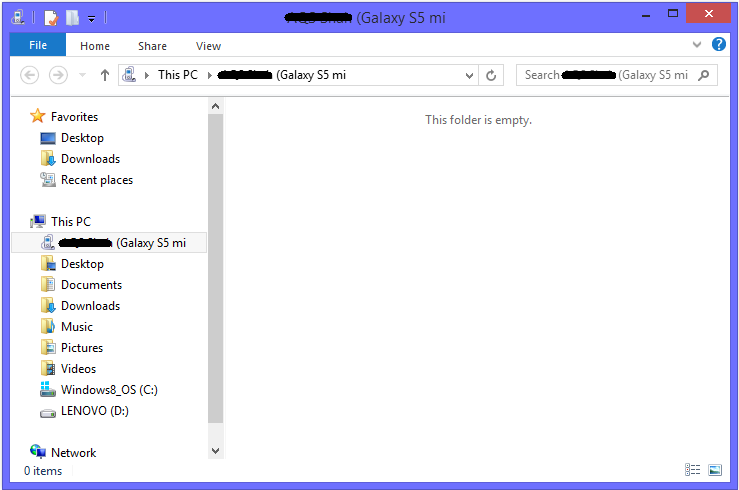 I think this (empty folder) is for security and privacy reason. That's why the computer does not want to show your stuffs to someone else. I mean if it shows then it would be very easy for other people to access your stuffs. Just by connecting your phone to other PCs. By unlocking your phone. I meant turn it on and unlock it by putting password, slide or finger print what ever you have set to unlock your phone. Doesn't work. I don't have a password lock, I just swipe the screen and I've done that. Does not work with S6.